Travel within the south is getting more convenient, thanks to the wide ferry services offered here at BusOnlineTicket.com. Set yourself on one of the famous holiday routes – Tanah Merah Ferry Terminal (Singapore) to Bintan (Indonesia) as we engage Bintan Resort Ferry Pte Ltd to get you to the largest island of the Riau Archipelago. Ranging from SGD 45 to SGD 67, it is an affordable ferry service to Bintan and Bintan Resort Ferry’s long existence since 1994 has instilled confidence in its passengers in terms of safety. There are up to six sailings available from Tanah Merah Ferry Terminal to Bandar Bentan Telani Ferry Terminal in Bintan. There are two departures at 5:00pm and two departures at 8:20pm daily, plus an additional two departures at 2:00pm during weekends. This frequent ferry service offered caters to more chances of passengers getting a ride while meeting their timing convenience and allowing them to enjoy the ferry ride in comfortable space within the approximately one-hour journey. The sailings back from Bintan to Tanah Merah Ferry Terminal is more limited though, with only two departures daily at 9:00pm. It is also crucial to ensure that you arrive at the terminal for check-in and boarding pass collection on time should you depart from Tanah Merah Ferry Terminal, as you will need to arrive at least 1.5 hours prior to the departure time. Same goes to departing from Bintan at Bandar Bentan Telani Ferry Terminal, passengers are advised to check in and collect boarding pass two hours before the ferry departs. Feel free to explore the ferry schedule according to your availability via our user-friendly booking machine at BusOnlineTicket.com. With just a click away, you will get to discover the ferry schedule and prices. 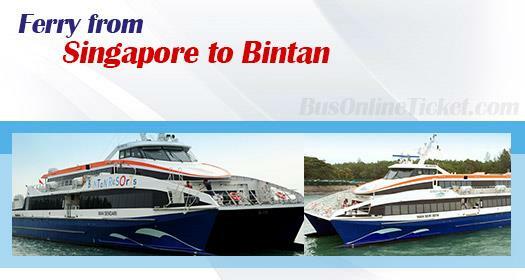 Obtain more details about the ferry to Bintan to plan your trip ahead. We love providing you travel tips as much as our bus and ferry rides at BusOnlineTicket.com. Stroll on the white sandy beach while enjoying the clear blue sea and cooling breeze of Trikora Beach that is a definitely a stress-free paradise! Too much relaxation? Get on the busy streets of Tanjung Pinang, the largest town at Bintan that allows you to shop for handicrafts, snacks and dried seafood while photographing the traditional buildings and structures. Once you have had your fill of walking, spend the day or night relaxing in Bintan villas or resorts such as at Banyan Tree Bintan. Talking about food, how can we miss Pasar Oleh-oleh? It is a Bintan Resorts personally owned market of souvenirs where you can also get dried seafood, keropok (prawn or fish crackers) and local kuih lapis (layered cake). Looking for island adventure? Bintan will not disappoint you as there are water sports, adventure trek at Bintan Mountain, Bintan Elephant Park, mountain biking and many others! Bear as many activities in mind as you can do in Bintan is more than just engaging in sight but it also satiates your excitement for adrenaline rush. Need not envious of your friends’ recent beach holidays as your turn is NOW! Let BusOnlineTicket.com take you there.